(Nanowerk News) Microorganisms often assemble natural products similar to industrial assembly lines. Certain enzymes, non-ribosomal peptide synthetases (NRPS) play a key role in this process. Biotechnologists at Goethe University have now been able to discover how these enzymes interact with each other (Nature Communications, "Structure-based redesign of docking domain interactions modulates the product spectrum of a rhabdopeptide-synthesizing NRPS"). This brings them one step closer to their goal of engineering the production of such peptide natural products. 3D structure of a non-ribosomal peptide synthetases docking domain pair. 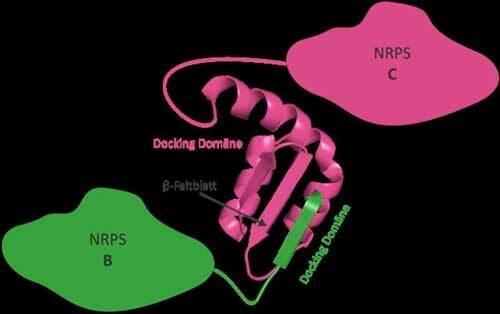 The docking domains of NRPS B (green) connects to the fitting docking domain of NRPS C (magenta) via a β-leaflet. Many important natural products such as antibiotics, immunosuppressants, or cancer drugs are derived from microorganisms. These natural products are often small proteins or peptides which are generated in the cell by NRPS enzymes similar to a modern automobile factory: at each station additional parts are added to the basic structure until finally a completed automobile leaves the factory. With regard to the NRPS, a specific amino acid is incorporated and processed at each station (module), so that in the end peptides emerge that can be linear, cyclic or otherwise modified including unusual amino acids. If larger peptides are generated by these systems, often several NRPS enzymes – or assembly lines – operate successively. The order in which this happens is determined by docking domains. These are small regions at the end of the assembly lines that fit with the next NRPS enzyme in line like a key in a lock. Although the basic principles of these NRPS interactions have been known for a long time, the structure of the docking domains was unknown until now. The research groups led by Professor Jens Wöhnert form the Institute of Molecular Biosciences and Professor Helge Bode from Molecular Biotechnology at Goethe University have now been able to successfully explain this.